Recently we were visited by a couple of individuals who refused to let keratoconus get in the way of pursuing their careers. One was a young man who wanted to follow in his father’s footsteps and become a commercial airline pilot, but could not meet the vision requirements with any corrective lenses. The other was a senior pilot who wanted to return to the cockpit, but whose worse eye perceived severe doubling of runway lights after crosslinking. We were very happy to receive updates on our two pilots. 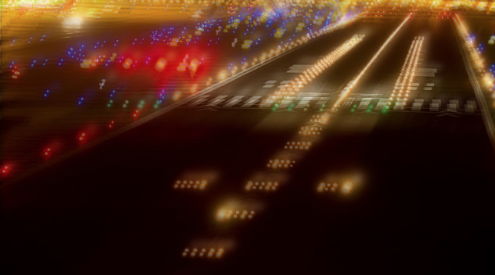 The senior pilot reported that in addition to being able to pass the flight physical, runway lights at night were once again single and sharp. This was the best he had seen as long as he could remember. He was going back to work. Our young aspiring pilot phoned excitedly to say that he passed his physical with sharp 20/20 vision in both eyes. After a three month review, his case was approved by the FAA and he is now in flight training. He said candidly that even if he had not passed his flight physical, his LaserFit lenses were well worth it in terms of improving the quality of his life. With FDA approval we will be surely seeing more and more patients having cross-linking. Although the two patients discussed had theirs done outside of the U.S., the results will be the same: some patients may see improvements in vision while others may experience a negative visual outcome depending on the precise nature of their corneal changes. While flattening may be the rule, exactly where the flattening occurs will determine the visual outcome. LaserFit lenses with wavefront-guided optics can mitigate the distortions and improve the visual acuity in keratoconus as demonstrated on these two pilots and many others over the past several years.